Hankyu Higashi Dori Shotengai is a network of shopping arcades in Umeda. 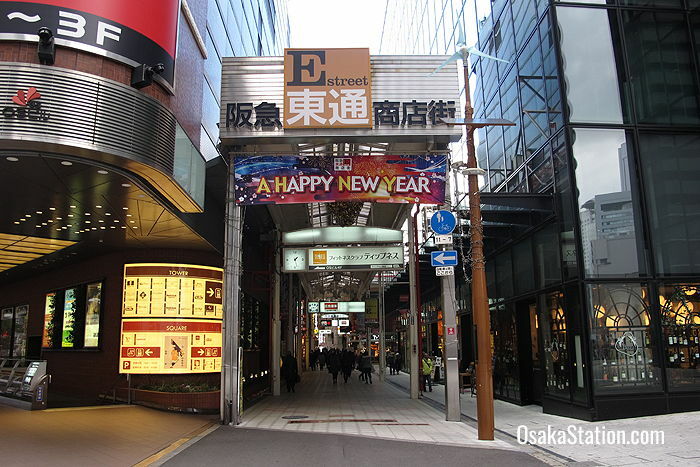 The name Hankyu Higashi Dori literally means “Hankyu East Street” and it describes the shopping district east of the Hankyu Department Store that developed in the post-war years. These colorful covered arcades are full of local character and they provide an interesting contrast with the stylish department stores and fashionable underground shopping malls in the rest of Umeda. Store prices tend to be cheaper here, and many businesses and entertainment centers stay open till very late. 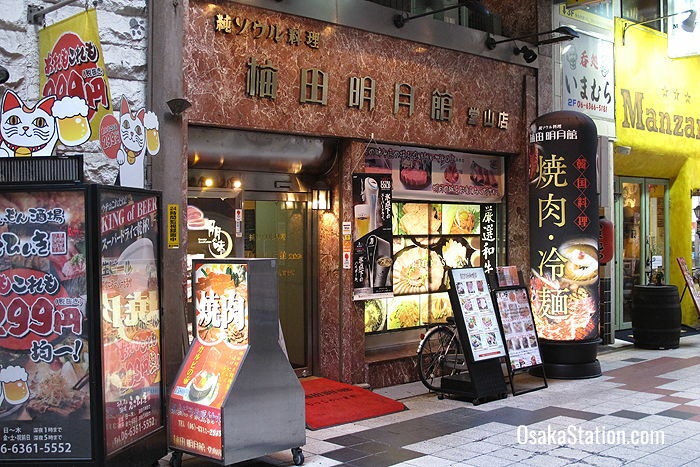 You can find a variety of game centers, pachinko pinball parlours, and karaoke shops in this area. However, the main reason to come here is for the food. 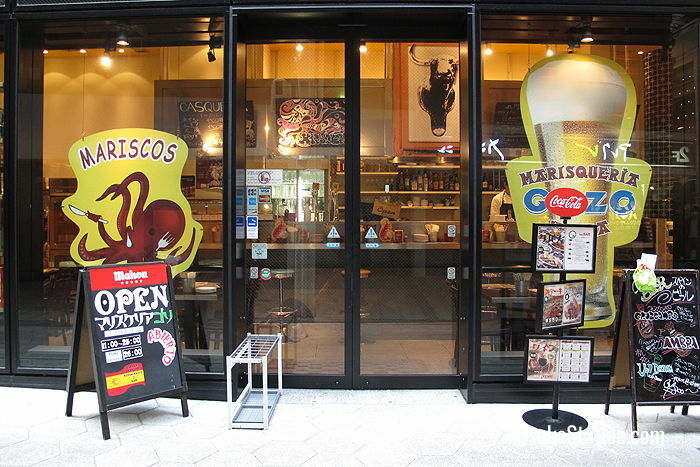 There is an incredible variety of restaurants here serving both local specialties such as okonomiyaki, kushikatsu and takoyaki, as well as every kind of international cuisine. Here are some highlights. 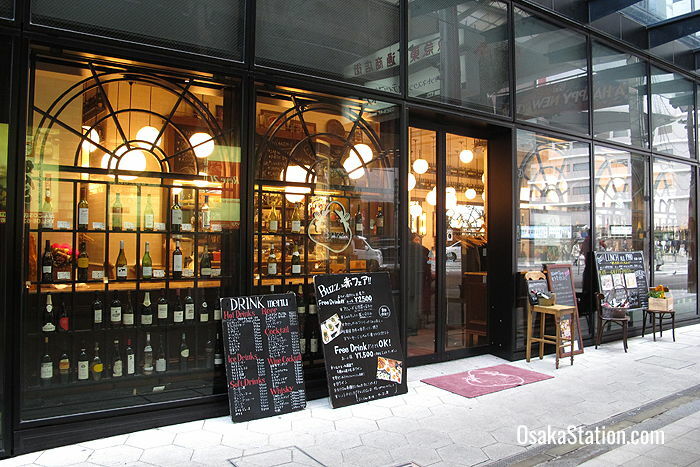 Buzz Umeda is a casual French style brasserie at the entrance to the first shopping arcade in the Hankyu Higashi Dori area. It’s a relaxing spot to come for a light lunch of Ehime pork pate with pickles and a fresh baked baguette. Wash it down with a glass of red or white from their extensive wine selection. Open: 11.00 – 23.30 (Last orders for food: 22.30 / for drinks: 23.00). Map. Marisqueria Gozo is a Spanish restaurant that specializes in seafood paella, or fideua which is similar to paella but uses noodles instead of rice. If you don’t fancy seafood, they also do chargrilled steaks. Light tapas and Spanish wines and beers are available at the bar. Open: 11.00 – 1.00 am (until 2.00 am on Friday, Saturday, and days previous to holidays). Map. 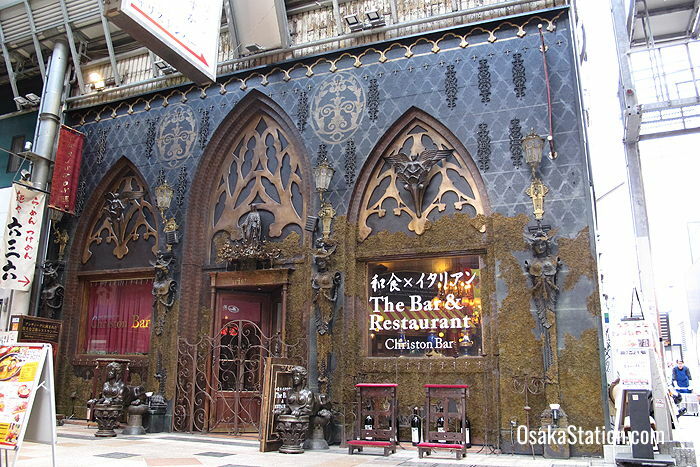 Christon Bar serves Italian cuisine, but the main reason to go there is not for the food, but to experience the over-the-top interior décor with plush seating, stained glass windows, chandeliers, dragons, and an odd assortment of sacred imagery. Open: 17.00 – 23.30 (until 4.00 am on Fridays, Saturdays, and days previous to holidays). Map. 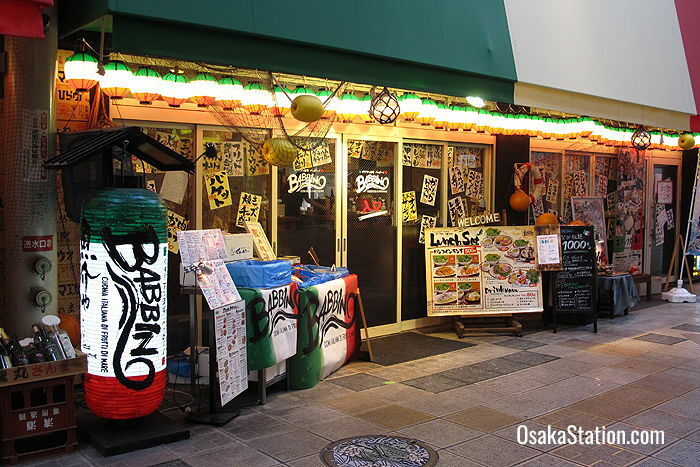 Babbino has the atmosphere of a typical cheap Japanese izakaya, or casual tavern, but they serve Italian style seafood. Recommended dishes are the seafood carpaccio, and their shirasu (whitebait) peperoncino pasta. Portions are generous and prices are cheap. Open: 11.30 – 5.00 am (until 7.00 am on Fridays, Saturdays and days previous to holidays). Map. 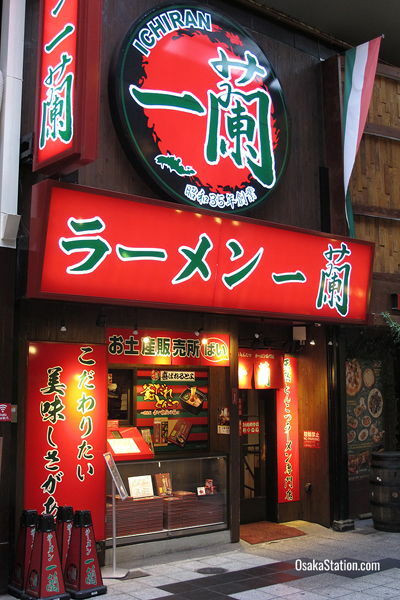 Umeda Meigetsukan is a Korean style restaurant specializing in yakiniku style char-grilled beef, but also serving a range of other Korean specialties such as kimchi pickles, reimen cold noodles, namuru vegetable side dishes, and chijimi savory pancakes. All their foods and flavorings are handmade and if you like their kimchi, you can buy some to take away. Open: 11.30 – 23.00 (Last orders 22.30). Map. 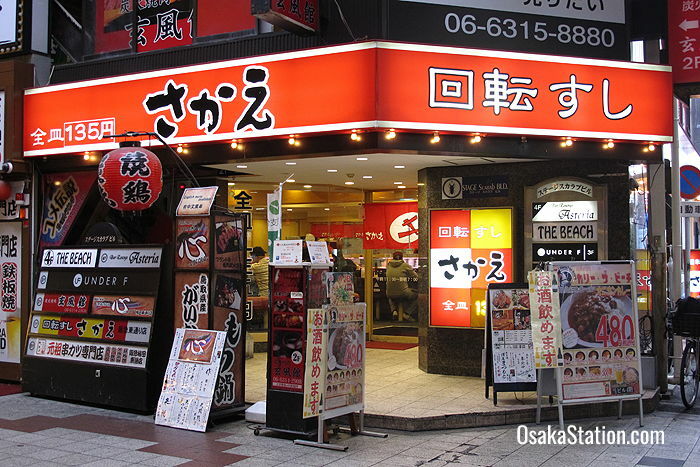 Kaiten-zushi Sakae serves the best conveyor-belt sushi in Umeda and at super reasonable prices. This is a casual and friendly restaurant where you sit at the counter and watch the sushi chefs prepare the food while you eat. You can eat in or order to take-away. Open: 11.00 – 7.00 am. Map. Ichiran serves Hakata style ramen: delicate wheat noodles in a rich and creamy pork bone tonkotsu broth that has a very deep flavor. On top of that are toppings of sweet chashu pork slices, chopped green onions, and a spicy red sauce with a very secret recipe. This popular shop is open 24 hours a day. Map. 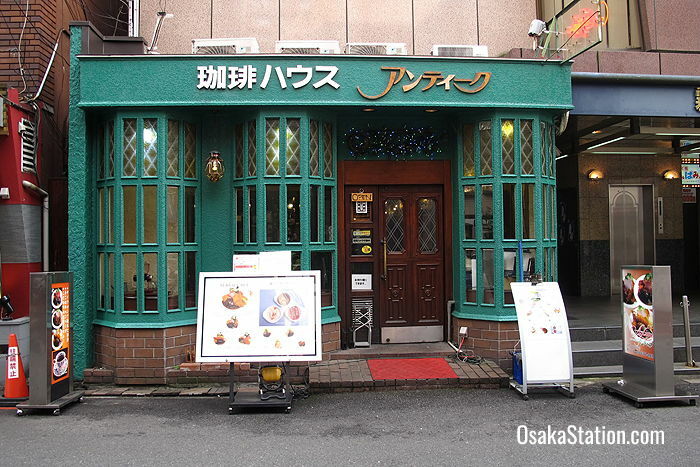 Antique is an old-fashioned kissaten or coffee shop with a cosy atmosphere which serves inexpensive set meals of hamburger steaks with deep fried chicken cutlets. Meals come with rice, soup and salad and are very, very satisfying. This shop is open 24 hours a day. Map. There are actually six streets in this area. The Dai-ichi, Dai-ni, and Dai-san shotengai (literally the 1st, 2nd, and 3rd shopping streets) run in a straight line from the west to the east and the other arcades branch off from them. You can find the entrance to the Dai-ichi shotengai directly across from the Hep Navio building.